All babies learn to take their first steps, and in this case, their first flight. Join Lydia, Hector, Pemby and Flora as they decorate the party tree for the traditional First Flight, a coming of age event for every crow baby. Getting the Party Tree ready in the nick of time is not easy for crows who are distracted by shiny things, and the day is spent in a busy bustle. Will they make it in time? 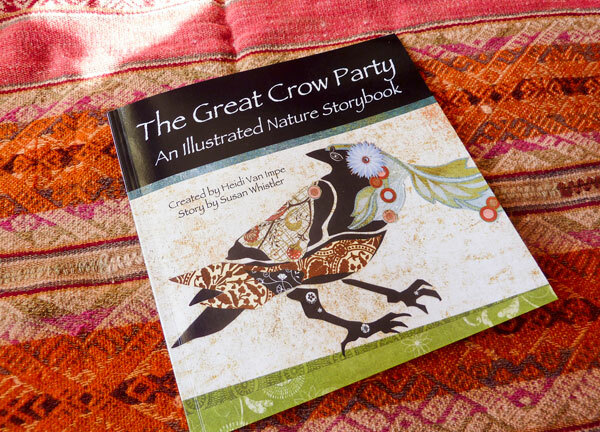 Find out in The Great Crow Party, a story designed to connect children with the magic of Mother Nature. Books can be purchased at the Salt Spring Gallery in Ganges, at Amazon.com or feel free to contact me directly. Why I created this book. Looking up is the easiest thing to do and wonderful things can come of it. In the city where I lived, the crows flew to and from their communal roost each evening and morning. Very gregarious, crows are like us and love to socialize, play and work together in groups. Nature is all around us, repeating patterns of our own nature like a pebble in a lake. Sharing this experience with others, our children, is our wonderful gift. On this planet, we are all storytellers. I choose to tell this story through paper collage, hoping to capture the charm and beauty of the crow families. Susan Walsh Whistler is a writer and lifelong resident of the Atlantic Provinces, currently living in New Glasgow NS. Originally from Newfoundland, Susan has long been inspired by the ties people form not only with one another but with the natural world around them. In her writing she draws heavily from her experiences living in communities with strong bonds to the sea and land, along with their own history. Images of the natural world figure strongly in her fiction and personal essays. 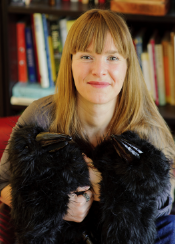 In writing The Great Crow Party, Susan had the opportunity to combine her interest in urban wildlife with an educational and artistic vision she hopes will inspire young children to see and appreciate the elements of everyday nature.